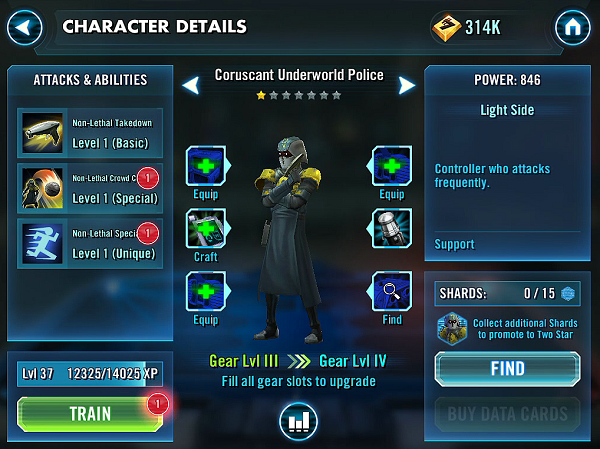 Coruscant Underworld Police is a support attacker. Let’s look at this brief guide and see what he has to offer to your team. Basic Ability: Non-Lethal Takedown – Deal Physical damage to target enemy with a 50% chance to Stun the target for one turn. Unique Ability: Non-Lethal Specialist – Coruscant Underworld Police gains 30% Potency. In addition, he gains 20% Turn Meter whenever he inflicts a negative status effect. This guy is actually decent if you choose not to go after an AoE damage team. He has the ability to stun using his first skill. He can also inflict offense down using his AoE, thus reducing the damage your team takes by half. That is a very useful crowd control skill to have. That skill works wonders against high damage enemies. Alongside the Clone Sergeant, they make a decent starter team on your line up. The few downsides about this guy is that he doesn’t have a leader skill and his health pool is low. Verdict: Only use him if you want an AoE team. I think I found a really, really good use for this guy, although I’ve yet to try it out. QuiGon gives a speed boost to JC & AT. With JC’s very low cool downs (I haven’t got JC’s “Jedi Healing” to a base of 3 yet, but I have got it down to 4, and I do have the power that gives basic attacks a 25% chance to reset, potentially allowing you to use your healing, hit, heal again. With the speed bump, that’s about as good as it gets. The RG is in there to stun their tank/taunter, allowing you to make sure you finish off that glass canon. Delightfully, RG is fast but not too fast, so you get to see whether or not you’ve obliterated the glass canon first, and possibly decide to use your stun chance elsewhere. The Offense Down power, though, is so amazing when combined with taunt and rapid-fire Jedi Healing. Add to that the fact that I can’t use this team during Light Side battles, and I am tempted to drop some energy on farming the Coruscant Underworld Police officer. Other variants of this would include swapping out Ahsoka Tano – currently used as an attacker + supplemental healing + her flat out speed. 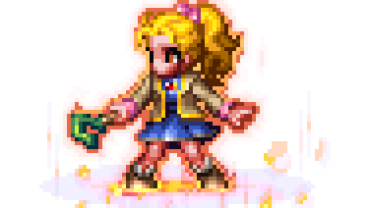 (Yes, her official stats are slow, but until she takes TWO critical hits, she’s damn speedy even before QGJ’s leadership bonus to speed. Since you’re not getting much offense out of 2 characters when you have the royal guard in there, you need to get the most out of what you have left. QGJ’s 2-turn cool down allows you to hit, then assist+hit, etc. Every other turn, you get an extra basic attack from a random ally. Ashoka & the JC do fine damage (nothing spectacular, but it’s still on the good side of average). If you don’t get one of those two, you either get a bonus attack from Han, which isn’t great, but it’s still a free attack + a 40% chance to boost his turn meter. Remember Han’s taunt is long – some would say too long. The assists allow him to skip forward in the action queue so that the taunt is more likely to end before he dies. OR you get the Royal Guard, who stuns 65% of the time for me (and I’m just a smidge away from making that 80%). More stuns means fewer attacks taken – either by Han or, after the taunt, by just anybody when you’re trying to drag out the battle to give yourself time to heal and reset your CDs. You don’t want to take much damage during the clean-up phase, b/c you want to take lots of time getting in small hits so that you can use JC’s heal as much as possible. (Ahsoka can help at first, but once the last enemy is in the yellow, her special power won’t heal anyone). But replacing RG with CUP gives you a chance to get AOE offense-down, which is much better than RG’s defense up. Plus, you get to use this team in Light Side battles. Plus you get better damage and you don’t auto-taunt, which can really screw things up some times (although at other times it’s nice not to have to use an action on the taunting). ————————-> As for replacing Ahsoka Tano, I have two possibilities in mind. So far I’ve used both as allies (when available) to this group and they worked wonderfully. The two allies that kick this into overdrive? the ally attacks increase the damage of a damage poor team, which helps. (But still, the other team is damage-poor when this speedy team takes out their glass canon before anyone on that team can even move, and then I hit them with timely stuns on other characters. But over and above this is the speed-down on Phasma’s AoE! Remember that it doesn’t matter how fast you are as long as you’re faster (preferably a lot faster) than your opponent. Ventress would look and feel speedy in-game if you ran her against a rancor with speed 40. The ally attacks are random, but getting as many as possible is an intentional part of the team’s recipe for success. The little guy gives a speed up to allies + a small healing boost. He doesn’t hit as hard as Ahsoka, but giving the whole team Speed-Up is just as good – if not better – than giving 60% of the other team Speed-Down. The advantage is to Phasma here, mostly. But Ahsoka’s supplemental heals have been very helpful at times, even with a hasted JC with a 4-turn cool down and the enemy’s turn meters being completely trashed by Han. Also, the other team can resist the Speed-Down of Phasma, but speeding up your own team hits everyone and no one resists. I don’t have either Phasma or Chirpa, but the team I’ve put together is amazingly strong. Even when I don’t Stun the Tank on my first turn, often the AI wants to get in one hit and spread the early damage its team takes when all the enemy are still alive and kicking. (Of course, I’m not going to oblige and spread the damage out, but it doesn’t really know that.) Usually by the time I’m done with my turn 5’s, the other team is only half-way through its character’s 4th turns, or sometimes just starting the 4th turns. Add in to that mix that the AI has one less character since either just before it started moving or just after it took its first turns, and you’re looking at massively more actions to trash the baddies PLUS you deny them the control that taunt gives over the enemy’s choice of target. You target the toons you want to target because your stuns disrupt the effective timing of those taunts. After taking out 2 damage dealers or 1 damage dealer and one healer, the taunt will come off, but by then it’s too late! If there’s still a healer around, stun the healer while you’re focussing on the Tank. If there’s no healer, stun the biggest damage dealer. That probably isn’t the tank you’re in the process of killing, but if it is, and if you don’t think you will have the toon polished off by the start of its next action, stunning a taunting enemy is **not** a waste. I’ve used this in the arena – many times. I tend to get absolutely killed when the AI plays my teams, and my rank always slips a lot, so I’m going to start playing the arena just before rewards are passed out instead of earlier in the day to make sure that my work climbing the ranks gets me the best possible token reward. But as bad as it is when you leave the team alone in the arena for the AI to play, I’ve taken out 9500 point teams with all 5 of my toons still standing…and my power has been between 7150 and 7900 the entire time I’ve been using this strategy. First, it could be on the tank again, in which case kill the healer NOW. Second, it could be on the healer, in which case start banging on the Tank with all your might ***Even if the Tank has not Taunted***. Another Stun/Taunt combo that might be interesting is Dark Side vs. Jedi. Old Daka, Ventress, & Royal Guard can all be on the team. Add Talia as the only other DarkSide healer. You’ve got NightSister synergy going here, so think about that while picking your last character, but the ability of Ventress and Talia to self-heal with basic attacks helps a ton. You might want to go high-health with the last one – Savage Oppress, maybe? But I think as glassy as he is, Dooku would be great here. he adds a whole lot of anti-Jedi stun. With FOUR stunners on your squad, but still plenty of healing and average-to-respectable damage you can cakewalk Jedi encounters that are otherwise ***very*** difficult. This combo of speed + stun + extra attacks (through turn meter manipulation or Speed-Up or by using Speed-Down on enemies) allows you to do just enough to temporarily remove a crucial piece of your opponent’s puzzle (by stunning whichever character is crucial in that moment and thus tattering their carefully-crafted synergies) and then rip through the health/hitpoints of the toon who most threatens your own plans. I see a great place for CUP in builds like that, especially for light-side battles.